Electoral and industry expert recognition in Scytl´s ability to address online voting security and verifiability challenges strengthens its position as market leader and worldwide reference in online voting security. Scytl, the worldwide leader in election modernization and online voting technology continues receiving electoral bodies and industry expert recognition for its end-to-end online voting security and verifiability. Recent publications from leading analyst firms such as IDC, government implementations such as those in Norway and Switzerland and industry panels and best practices workshops as those organized during e-Voting.cc reinforce Scytl´s leadership in secure and fully verifiable online voting. With the uptake in online voting across the globe, the need to address end-to-end security and full verifiability is taking precedence over providing efficiencies and accessibility. Recent research from industry analysts and governments looking to implement online voting highlights the need to address various online voting security challenges. The integrity, security and verifiability of the election process are Scytl´s highest priorities and fully address these challenges. 19 countries have already put their trust in Scytl Online Voting a solution that enables: voter authentication via digital certificates, end-to-end voter privacy by encrypting the votes on the voter’s device, voter privacy during vote decryption via cryptographic mixnets and secret sharing; vote integrity and authenticity via voter digital signatures; election monitoring with immutable logs and full election verifiability thanks to individual and universal verification. 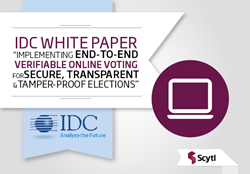 IDC: In the recently published IDC white paper, sponsored by Scytl, “Implementing End-to-End Verifiable Online Voting for Secure, Transparent and Tamper-Proof Elections” IDC highlights the need for governments to implement the necessary information security controls to ensure the security and verifiability of online voting processes: strong voter authentication, voter privacy, verifiability, and election integrity. Governments: Forward thinking governments are already reaping the success of fully verifiable online voting: Norway which pioneered the first fully verifiable online voting process and most recently, the Canton of Neuchâtel which recently presented it´s roadmap for universal and individual verifiability. EVOTE2014: As a result of Scytl´s interactive workshop during EVOTE2014 “The 10 Pillars of End-to-End Online Voting Verifiability” experts from academia, governments and businesses from across the globe either already embarked in online voting or those looking for insight were able to share and discuss industry best practices on the best practices required by any organization looking to implement secure, transparent, auditable and verifiable online voting processes.